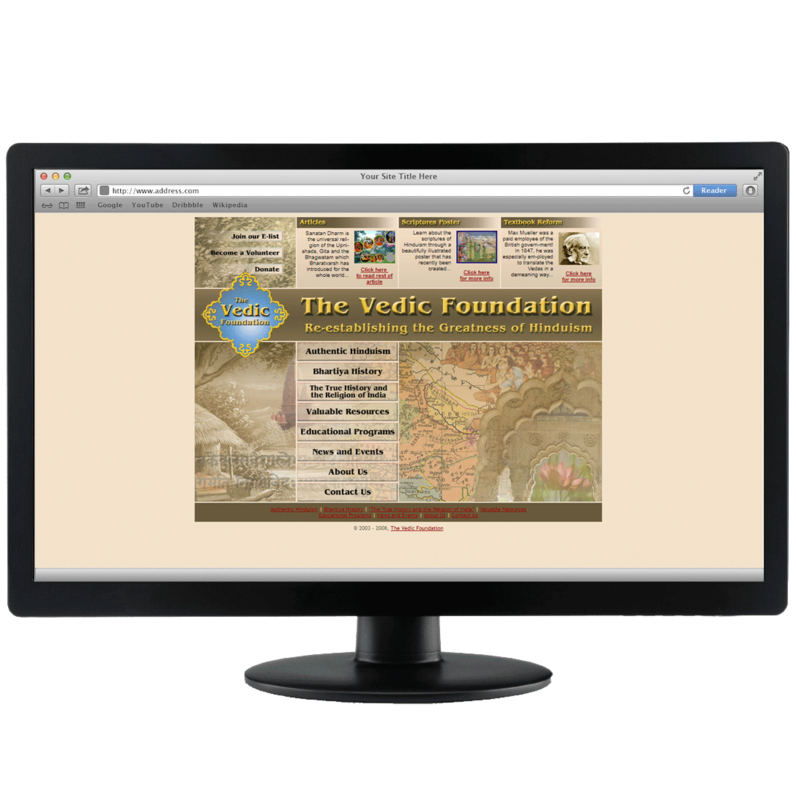 2006: Digital Newsletter "Messages of the Vedic Foundation" Following up on the website, in the period 2004 – 2006 a number of newsletters were made. 2005: Several PowerPoint presentations were made to help propagate the ideas of the Vedic Foundation. 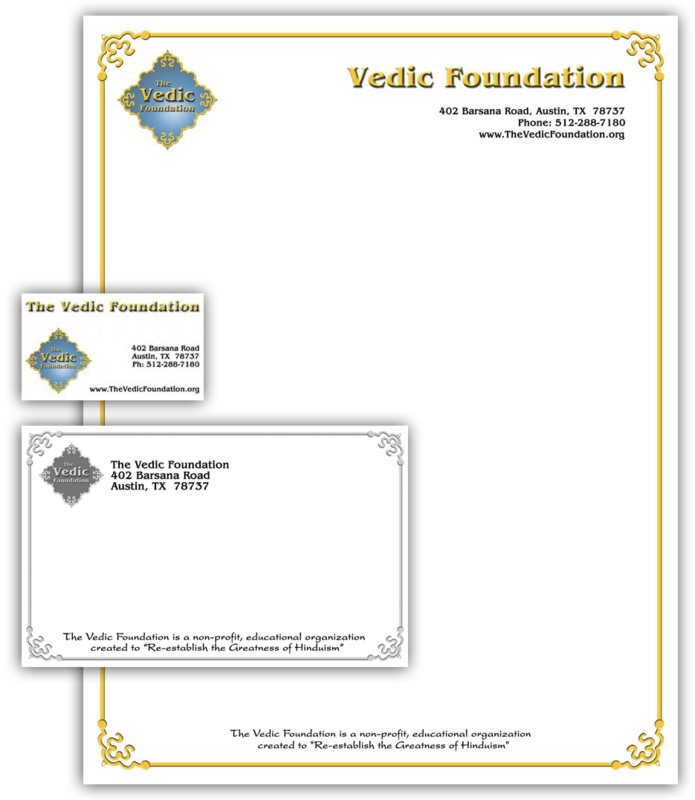 2004: Stationery "The Vedic Foundation" We designed stationary to go with other designs, like business card and mailing labels as well as the website. Full color, letter size, printed as background with MSWord documents on the spot. Mailing Label "The Vedic Foundation" Used as complement card with mailings. Printed eight per page (letter size), black&white. Business card "The Vedic Foundation" Simple design, the logo needs to draw all the attention. Printed for different members of the Vedic Foundation, we made different options. 2003: The Vedic Foundation, as the name suggests, works with the Vedas, the history of India and her heritage. The design for the logo clearly needed to state something "Indian" (the round shapes derive from Indian architecture. The colours used also needed to suggest wealth (deep blue and gold). We designed two versions for black&white. Website "The Vedic Foundation" With this product, the customer wanted to return to the traditions and religion of India. The site consisted (October 2006) of about 100 pages. We made it in Dreamweaver and maintained it until 2007. Folder "The Vedic Foundation" A unique folder at legal size (8.5 in x 13 in). Printed at 260 gr. Glossy paper, full colour. We designed the front collage specially designed for The Vedic Foundation (see also image above).